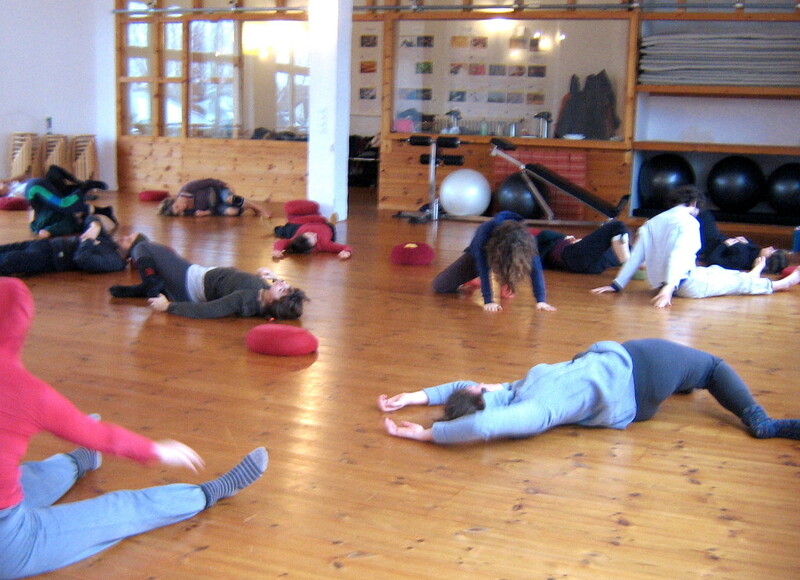 This is the third day of a five day winter intensive with Joerg Hassmann. We sit on the ground with our legs crossed or similar, and we use the ball of our foot to massage our thigh; pressing it in; putting our weight onto it; we also use our hands for self massage too. This is the start to my favourite day of the intensive, and there’s a lot of material! We sit on our haunches and bring one of our legs out to the front which we can circle on the floor. We repeat the exercise on the other side too. Someone asks a question about getting up to standing: use your head like in a handstand and look behind you as you come to your feet says Joerg. We find a partner. The receiver of the bodywork lies on the ground on their side, and the giver of the bodywork is beside them. We take the arm which is upward facing – since they’re on heir side – and we lift it and move it. The receiver is completely passive and accepting. We can push our hands deep into their arm pit and support the arm so that it is proud and ‘sitting’ in the arm socket. It’s quite an intimate movement and one must be fearless in regard to smelly armpits! We repeat this exercise for the other arm, and then exchange roles. We stand on our feet and bend at the waist so that our hands touch the floor.We can swing them – pendulum like – and draw with them on the floor surface. It’s like preparation for a handstand although Joerg suggests that our chest can touch our thighs which makes it different! We work with a partner. One of us maintains our ‘doubled-up’ posture described above, and the knees beside them and other brings their hands into contact. The standing person rocks back and forth on their feet transferring weight between them. The movement is partly initiated by the kneeling person. There is a sense that ‘non-falling’ occurs as the standing person goes off-centre and is occasionally caught by the kneeling person but there is no significant weight transfer. There a few choices in this exercise: when the standing person goes off-centre, they have a choice of maintaining softness in the leg receiving their weight or pivoting on it like it was a peg! The latter transfers weight to the kneeing person in a more dramatic falling manner but it’s a little uncontrolled! 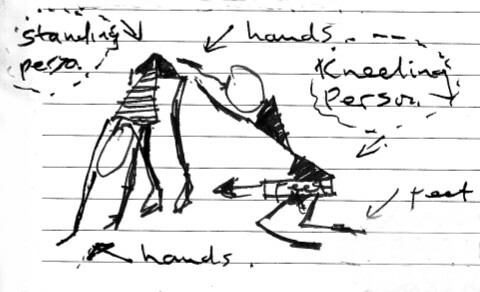 We repeat this exercise with the kneeling person using other parts of their body than the hands to receive the weight of the standing/falling person and to steady them. We use our arms, shoulder, back, etc. Finally, we set up the two dancers such that the kneeling person is at the feet of the standing person. They are orientated to the side of the standing person with their back in contact with the side of their partner’s legs. It’s as if the spine is aligned with the leg! Once the standing person ‘falls’ then their hip is at the pelvis of the kneeling person who goes into table posture. Infact, we can extend the falling into a spiral if we wish, thus the over-dancer is now across the under-dancer rather than parallel with them. We gather in a circle and Joerg asks us for feedback on the exercise. We examine a couple of discoveries which participants have made, and which they demonstrate to us all. One is that the person receiving the falling person can catch them not on their back but on their front. To set it up: stand beside the falling person – pelvis facing them, and put yourself between them and the ground by falling together. ie they fall onto you! The receiving person (under-dancer) uses their hands to maintain the connection in falling. The receiver is not leading but following; it’s quite an ambitious movement as the falling person is on top the other dancer when they are on the ground. In practice, it can seem that one dancer is grabbing the pelvis of the other. There’s a lot of potential for confusion!! The exercise we’ve undertaken so far is a little contrived. We practice a situation where we’re walking with a partner and their is contact at the shoulder and pelvis. One of the partners gives their weight to that other at the hip and pelvis and then that person moves into table position with their partner caught on their back (across it). It’s actually fairly easy even though all the weight of the partner is received onto the back of the under-dancer/dancer in table. 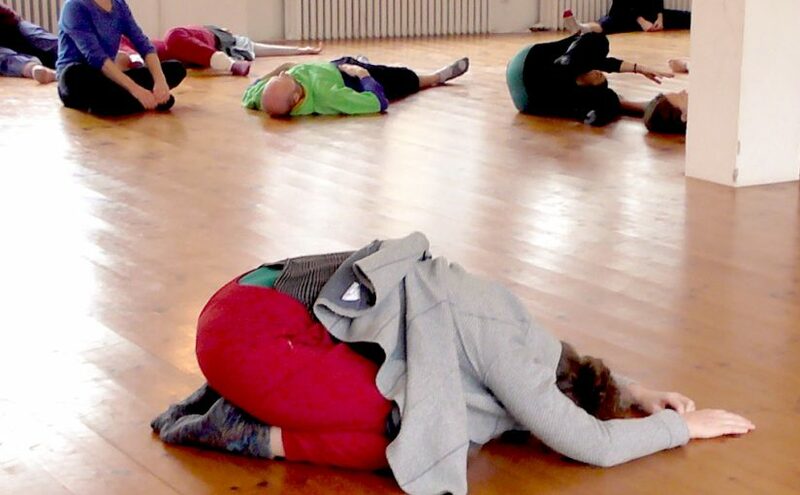 I first learnt this movement from Eiske Seidel at a workshop in London and it’s considered a ‘classic movement’ sequence in contact improvisation. Now we practice it in the context of Joerg Hassmanns teaching. Working with a partner: one person is on all fours in table position. They’re the ‘goat’. The other person stands in front of them with their back to their partner. The ‘goat’ knocks on of the knees of their partner by moving forward – like a goat!! The standing partner then falls – actually spirals down, ‘sitting’ on the back of the goat. From this position then the outstretched hands can be used to trace a movement pathway to behind them and to the ground. It’s as if your diving and your shoulders and then pelvis follows this diving but note that their no ‘jumping’, and in practice sliding on the partner in table can help enormously. After lunch, we undertake bodywork similar to that in the morning except this time working on the leg. Working in pairs, the receiver of the bodywork lies on the ground on their side, and the giver of the bodywork is beside them. We take the leg which is on the upward facing side – since they’re on their side – and we lift it and support it on our shoulder – for example – so that it hangs freely, and move it. The receiver is completely passive and accepting. We can push our hands under their buttocks and around their leg socket, to support the thigh so that it is proud and sitting in the socket. We repeat this exercise for the other arm, and then exchange roles. Then we dance/jam freely in contact improvisation but we don’t use a score – like the previous day. Joerg shows us lifts in a high bridge position: working with a partner then the underdancer or base, stands and bends at the waist offering their back to the dance partner who is the over-dancer – like a saddle. Then under-dancer is in contact with their partner and they shuffle their weight back and forth, offering their back onto which the over-dancer takes a ride. They don’t jump! There is continuous contact between the dancers and so it’s a smooth giving of weight. Joerg shows us a variant, where the under-dancer is bent at the waist and they stretch their arm up which the over-dancer can touch. It’s reminiscent of a throw in some martial arts but importantly the under-dancer is not holding the hand of the over-dancer – there’s no grip! It’s an invitation. I work with a person who is taller than me and as we have different heights at the pelvis then this makes it more challenging. When the over-dancer is taller then they can put their hands onto the back of the under-dancer to assist the weight transfer. Equally, if the under-dancer is taller then they can bend at the knees which lowers their pelvis height and/or widen the distance between their feet which once again also lowers their pelvis height. I notice that when I am the under-dancer then I have a habit of taking a step away from the overdancer once contact is made which can make this manoeuvre more difficult! Perhaps I should step the other way – into them? Or not step at all! !